Now What! 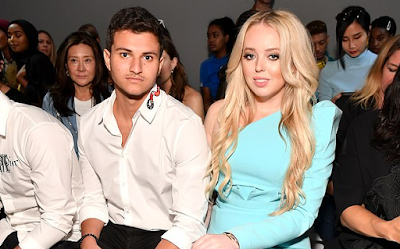 : Donald Trump's Youngest Daughter Is Dating A Man Raised in Nigeria. Page Six reports that the youngest first daughter brought Michael Boulos, heir of multibillion dollar Nigerian conglomerate Boulos Enterprises, to Thanksgiving dinner at Trumps' Mar-a-Lago. Despite their public appearance, a source tells Page Six Tiffany is 'happy she has so far been able to keep this with Michael under the radar'. 'She introduced him to her family at Thanksgiving, and he comes across as a very intelligent young man from a great family,' the source said. 'There was no mention of the president's unfortunate comment about African nations,' they added. Boulos' family is of Lebanese decent and was raised in Lagos but is now based in London, Page Six reports.